Home Cover Feature THE VULTURES ARE CIRCLING…LITERALLY! Can you imaging my surprise yesterday when Steve calls me on the cell phone as I'm sitting at my computer and says "GET OUT HERE!" ….I sez "GET OUT WHERE? "…..he sez "THE DRIVEWAY"
I run outside and ask whats up and he points to the sky and says "BIRDS"… OMG there were at least 50 turkey vultures soaring ever so gracefully over our Douglas Fir trees (Cayennes old nesting ground). But one thing I knew…these modern day pterodactyls were enormous!! 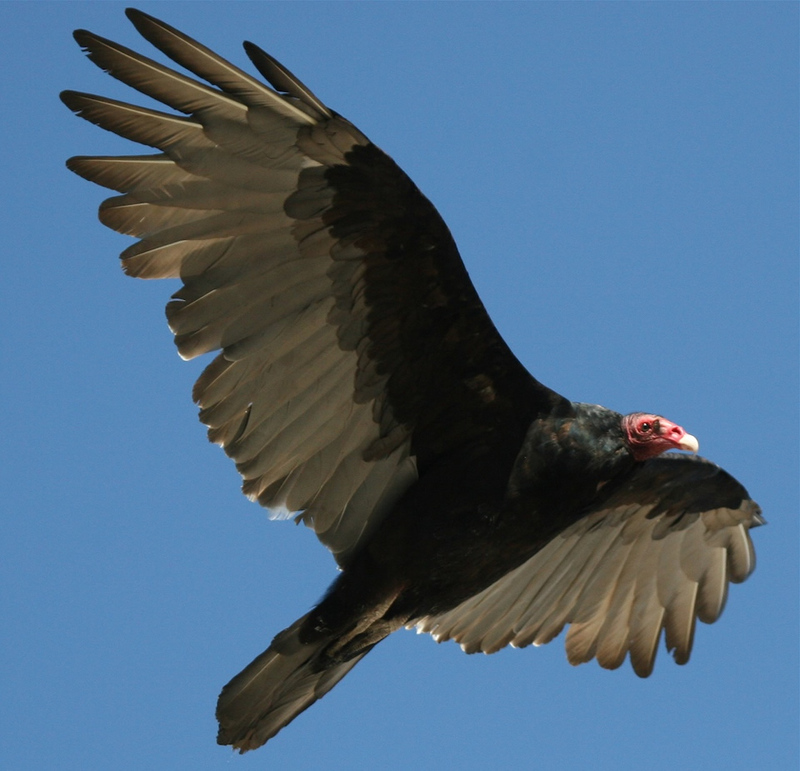 At Twenty-five to 32 inches long, with a wingspan around 6 feet a healthy adult turkey vultures weighs in at approximately 5 to 6 pounds. The word BREATHTAKING is the only way I can describe the scene because I had to literally catch my breath a number of times as I gazed at the spectacle above me. Once I got my photos up I then had to decipher what they were. They are so very close to a Golden Eagle in silhouette, and I had no color in these images from the time of day they were shot, so the white banding on the vultures was absent in my photos. A quick inquiry on one of my Birding ID groups on Flickr gave me the answer. There were so many birds I couldn't get them all in one shot. The currents must have been perfection as the vultures caught the draft and climbed higher and higher….never once drifting away from the invisible perimiter of our fir tree clump. The silence in the air was deafening…almost surreal. I expected to hear screeches or some sort of sound (not yet knowing these were vultures) . Once identified I read that vultures don't have voiceboxes!! They can only hiss. As the sun started to drop in the sky, the vultures settled in on our trees for the night. I could hardly sleep and set my alarm to catch them as they woke up with my 400 telephoto lens….but alas the fog was as thick as pea soup!!! I'm not disappointed though. I am thrilled after 12 years of living in the city of Portland that such a sight could be witnessed from my own yard. From my research it sounds like this group may be gathering to migrate south, as they were not hovering for prey. Speaking of Vultures…I dug into my archives to show you these from our Botswana Africa trip. They made my garden variety vultures look dwarf in comparison!! The garbage disposals of the savannah! A happy group in Botswana , looking out for the latest kill. Another way to define this particular vulture in the air is its rocking back and forth soaring pattern. whereas an eagles wings are quite straight out to the sides of its body when soaring, turkey vultures have their wings in a slight V pattern and they will rock lightly from side to side. I just bet you might see more of these in the next few days if the weather permits. they truly are beautiful in flight, not so pretty close up tho…..hehehe. they have that "turkey" head. we see them here in MN along the Mississippi and when my mom had her apt on the bluff along the river we would see them flying right by the window ……..wow….what a sight!!!! you have some awesome pics Sandy!!!! !